Hi all. And a happy new year to you. I’m writing this in my den – the study/studio/mix room I’m building in the house I bought with Mel. With the move taking up so much time, I’m aware that things have been slow around here of late, and with much home-making/furniture-building chores still to do, I’m only cautiously optimistic that’s going to change in the immediate future. But still, I love doing this and I enjoyed it this year, particularly until around September when things started to get stressful, so there’s no danger of me stopping any time soon! Once again, here’s a round-up of some favourite things from the blog this year. Some of these have gotten some decent traction, others less so, but I’m picking on the basis of what I enjoyed writing and what I’m still proud of now. If some of these passed you by at the time, you might find some of them interesting. Have a great new year, whatever you’re doing. See you soon! This entry was posted in Music and tagged Aimee Mann, At Seventeen, Beast Epic, Bullet Proof... I WIsh I Was, Clip show post, Day of the Dead, Don Juan's Reckless Daughter, Grateful Dead, Iron & Wine, Janis Ian, Joni Mitchell, Ladybug, OK Computer, Radiohead, Sera Cahoone, Stella Blue, Tim Hardin on December 31, 2017 by rossjpalmer. Like many records that were among my favourites in the 1990s and early 2000s (that is, my teens and early twenties), Radiohead’s The Bends is not one I pull out much anymore. But the recent spate of articles to mark the record’s 20th anniversary prompted me to dig it out for a few, hugely enjoyable spins. The first listen was pretty weird. I have so many memories connected to this album, and I’d have said it was one I knew well, but while my recall of the key elements of the songs and their structures was fairly unerring, little details did leap out at me for the first time. First the bad stuff, to get it out the way. It’s definitely a guitar player’s album, which I loved about it in 1996-7 (The Bends and OK Computer were sacred texts to me, and Greenwood and co. sort of guitar-playing high priests), but there are times when the focus is on the guitars so much that it’s to the detriment of the overall: listen to how much more authority Phil Selway’s drums seem to have during the intro to, say, Bones than the during the intro to The Bends; to allow him to fit inside a mix utterly dominated by rhythm guitars, he’s been so heavily compressed on The Bends that not only do his drums sound tiny, they seem to drag behind the beat. Drums give rock music its drive, its weight and its physicality. A more balanced, harder-rocking mix exists within the master tapes, I’d wager. I hope one day some enterprising soul at Parlophone gives album producer John Leckie the masters and lets him do a remix (25th-anniversary edition in 2020, guys? Just an idea). But the weight given to the guitars by mix engineers Sean Slade and Paul Q. Kolderie does allow us to hear how every song on The Bends is filled with amazing parts, whether it’s Greenwood’s constantly ascending octave-chord lead during the intro to Just (repeated at the end of each chorus), the pillow-soft acoustic guitar strumming of [Nice Dream], or the decelerating tremolo effect (Jonny again) in the verse of Bones. Radiohead’s early albums saw Greenwood, O’Brien and Yorke expanding the vocabulary of rock guitar more than any of their contemporaries with the possible exception of Rage Against the Machine’s Tom Morello, a veritable one-man factory of astonishing effects and textures. Let’s take a couple of the album’s less frequently hailed tracks and look a little closer at what’s going on. The “big”‘ songs on The Bends have been dissected and analysed to death, so let’s go with Bullet Proof… I Wish I Was and Bones, a couple of album tracks you’re not likely to hear on the radio soon. Bones sounds to me like the most confident full-band performance on the album. Some of that may be a perceptual thing, a result of the space afforded to Selway’s drums and Colin Greenwood’s bass (great tone!) by the sparse guitar arrangement in the opening verse. But really, it swaggers in a way that very little else in the Radiohead canon does, and that’s encoded in the song’s DNA. Yorke and Greenwood’s later involvement in the soundtrack to Todd Haynes’s Velvet Goldmine merely confirmed what a listen to Bones suggests: that behind their studious exteriors lurked a couple of long-time glam rock fans struggling to get out. The vamp on A played by the guitars at the during the chorus to Bones – possibly the lowest-IQ guitar riff in existence – goes back through Keith Richards all the way to Chuck Berry, but when it’s played with that much distortion and an almost audible leer, the only provenance can be glam. If Noel Gallagher were to end up in a pub with Greenwood or Yorke, they’d be fine as long as they talked about T. Rex and Bowie and Sweet. Elsewhere during the song, Greenwood pulls out his old favourite, the oblique bend (when a note played on, say, the G string is bend upwards by a tone to sound in unison with a note two frets down on the B string), for lead guitar interjections between Yorke’s vocal (“You’ve got to [whee] feel it [whee] in your bones”). Apart from the decelerating tremolo I spoke about earlier, none of the stuff going on in Bones is clever or unusual or groundbreaking. But, given the typically dour subject matter, the musicians seem to be having an awful lot of fun on this track. Bullet Proof… I Wish I Was is something else again, a narcotised wisp of a song, with ambient noises running all the way through it, apparently played by O’Brien and Greenwood without listening to the backing track on headphones (this may be overstated since a lot of the noises are specifically tonal, unless Leckie got the scissors out). But it’s Greenwood’s delicate arpeggio part on the chorus that’s most telling. It’s done by playing a fifth and third on the D and B strings and letting the open G string ring out in the middle, so it only works on a few chords, but it’s beautiful. I’ve been playing variations of that riff on my own songs and other peoples’ for a good long while, in fact. It’s another song where the rhythm section shines, too. An unfortunate by-product of modern (and in the terms I’m talking about, The Bends is modern) mixing and mastering practice is that quiet, sparse songs tend to have more weight in the low end and greater size to the drums than their louder counterparts, and Bullet Proof is a great example of this. The more you turn it up, the more impressive it sounds (The Bends and Just exhibit the reverse behaviour). Colin Greenwood’s bass line, in which he plays single high-register notes with quite a thick, sustaining sound, is particularly effective and foreshadows the pivotal role he’d go on to play in OK Computer and Kid A. 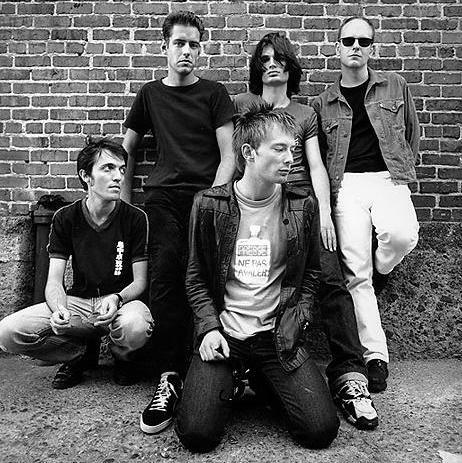 The band may see The Bends as a piece of juvenilia, or a necessary step on the path to where they wanted to go, but it shouldn’t be judged by its influence on bands with scarcely half of Radiohead’s combined imagination (you can probably guess who I’m thinking of). This is a collection of top-notch songs* topped with some of the most inventive guitar playing you’re ever likely to hear. This entry was posted in Music and tagged Bones, Bullet Proof... I WIsh I Was, Colin Greenwood, drum sounds, guitar sounds, John Leckie, Jonny Greenwood, Just, lead guitar, mastering, mixing, Phil Selway, Radiohead, record production, The Bends on April 16, 2015 by rossjpalmer.